High Velocity Profits is the only “buy and hold” investment approach with the potential to beat even today’s volatile markets. 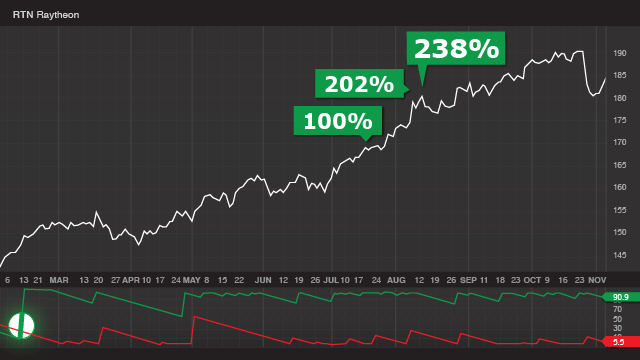 Editor Keith Fitz-Gerald runs this hyper-selective (but low-maintenance) service that only buys stocks that are going up – without fail since 2000. He overlays a value filter to find stocks worth owning, then watches their charts for a very specific and powerful “X” pattern to form. This signals that a stock is about to enter a state of high velocity – typically within a 48-hour window – and signals a “sell” the moment that velocity gives out. Average hold time is 16 months, and there’s very little trading to do in between in this stock-only system. If you’re an High Velocity Profits subscriber, click here to login. If not, see below for more information about High Velocity Profits. Hi, I’m Keith Fitz-Gerald – Chief Investment Strategist here at Money Morning. And selling them when you see it again. There’s the first X… here’s the second. That making money in the markets can’t possibly be that easy. Well, I’m here to show you just how WRONG they were. In fact – I’m generating more money now than anyone ever thought possible. To 210% per week over the last quarter! To 313% total per week on average over the past 30 days. And a more than 9.5% return on your money every hour the market is open! All from just one type of “accelerator” play I recommend. Warren Buffet, the world’s richest investor, became a multibillionaire on gains of 23% per year. Right now, based on my weekly average gain of 313%, I’m showing my readers 707 times those returns! I’m going to ROCK the financial world with another wager. I’m going to put $9.75 million on the line that says I can show you at least 350% total gains per week on average between now and the end of 2018. Results I MUST deliver in 2018 – or I’ll owe you BIG TIME. But the bottom line is very simple. I can raise my “bet” five-fold because I’m 100% confident that the astronomical gains we’re seeing now will continue to accelerate. My readers are getting the chance to make so much money right now because of these simple Xs, I don’t want you to miss out. So, I’m going to explain everything for you here. Or you can let me send you my trade recommendations – and take me up on my astonishing $9.75 million wager. Either way – I expect you’re going to see plenty of opportunities to make a lot of money over the coming months… and for as long as you choose to use this ridiculously simple strategy. These “Xs” show up in dozens of stocks every day – no matter what’s happening in the market… in the economy… in politics… with the FED… over in North Korea… in China… Russia… or anywhere. 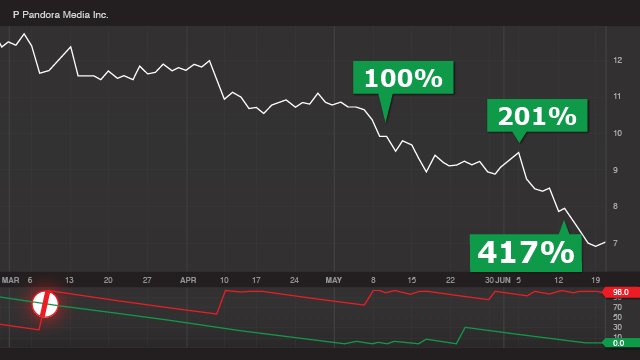 Down markets or up markets – these Xs keep showing up. That’s more than one per week on average for all of 2017! 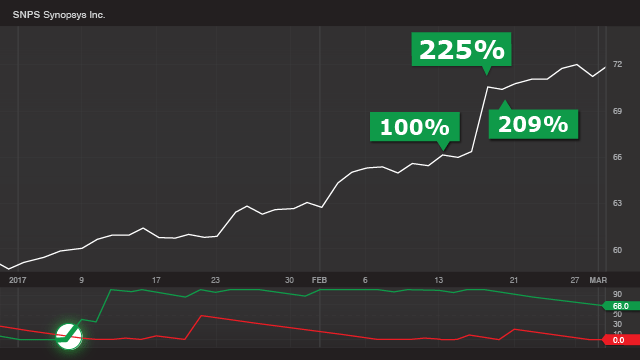 Now, those totals (including my average weekly gain of 313%) cover all my plays equally – whether we closed out a recommendation all at once or cashed out a portion for gains and then did it again. Just to be clear, that’s every winner and every loser, too. All these triples you’re seeing here aren’t just gains that could have happened. These are ACTUAL gains I showed my readers. Let me show you how easy it is right now. Quest Diagnostics Inc. offers medical diagnostic services to patients, hospitals, and medical clinics around the world. As you can see, its stock chart has been a thing of beauty since early 2016 – almost a straight line going up… up… up. Now, I could have bored you with all kinds of earnings reports, industry trend studies, financial statements, and other data that might have suggested Quest Diagnostics was a good investment at the time. But none of that matters! Quest’s stock price began a nearly uninterrupted surge higher for four straight months. And 300% in 79 days. Sometimes the gains come even faster. Like when this “X” pattern showed up recently in Synopsis Inc.’s stock chart. There it is… the green line crosses the red – an “X” is formed. And 209% in 16 days. 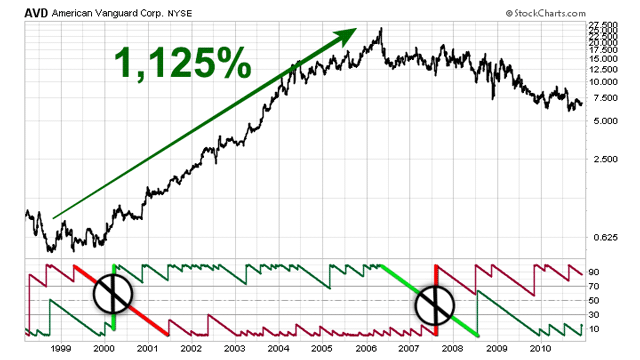 Then there’s gun maker Sturm, Ruger & Co.
Green line jumps higher over the red here… an “X” is formed. Including a 100% win in a single day! 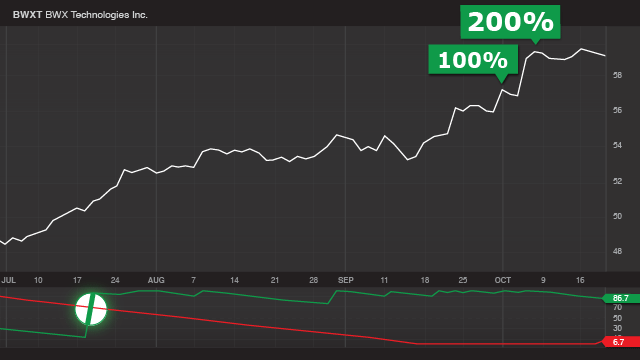 Just one day after my recommendation goes out – we have another 100% gain in hand. And I’ll show you why, when they intersect to form an “X” it creates one of the most powerful moneymaking forces you’ll ever see as an investor. Because when you can eliminate all the noise and clutter – and focus only on stocks that are going up… there’s no limit to the amount of money you can make. 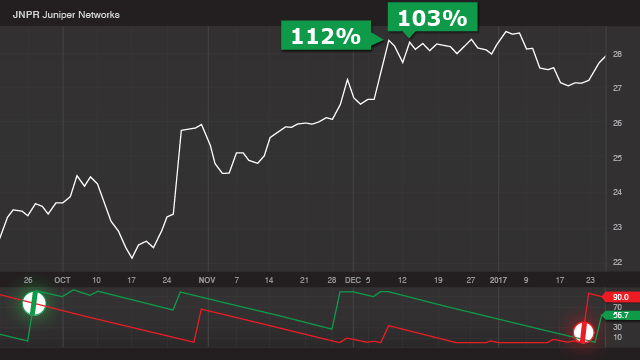 How great of a Christmas could you have had last December racking up top gains of 100%… 112%… 100%… 100%… 50%… 100%… 123%… 165%… 39%… 103%… 135%… 48%… and 100%. Or how lucrative these past few months with wins of 100%… 35%… 200%… 212%… 100%… 50%… 161%… 105%… 77%… 100%… 202%… 125%… 200%… 200%… 100%… 101%… 100%… 100%… and 100%. No investment strategy is perfect all the time. It’s always possible a stock could quickly change directions even after the X Pattern appears – which can lead to investment losses if you’re not prepared. That’s why I’d never recommend betting the farm on just one trade or one type of trading. These are actual gains my readers saw from the research and recommendations I sent them. Some were so thrilled that they took the time to shoot me a note. “Another 100% gain – I don't think I’ll ever get tired of WINNING!" And these are just a handful of the readers we’re hearing from since I began sharing my “X” strategy. 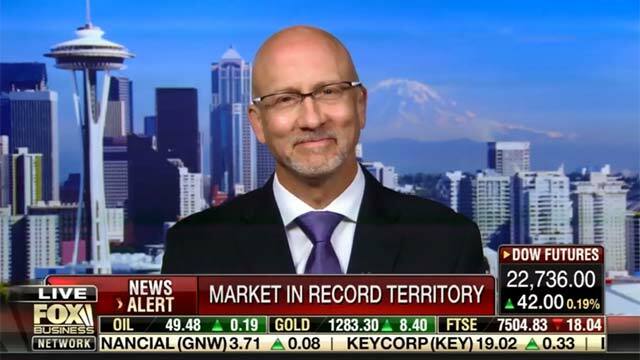 I’ve been in global markets for 35 years now. My expertise is in identifying market patterns others don’t see – and finding ways to leverage those opportunities into big, fast windfalls. Could there have been a clearer “signal” that Teleflex’s stock was about to soar than when this “X” showed up in the chart? You can see it was practically begging us to trade the stock. And within two weeks, my readers could have grabbed a solid 100% gain. Look at BWX Technologies and that beautiful “X” that formed in late July. 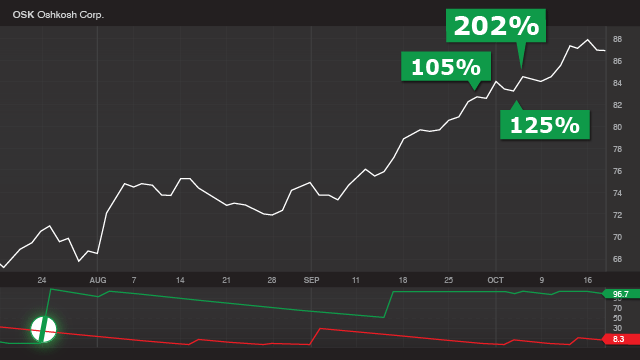 I put out a recommendation shortly after… and so far my readers have had a clear shot at 100% and 200% gains. And you see the steady rise in the stock price that followed. 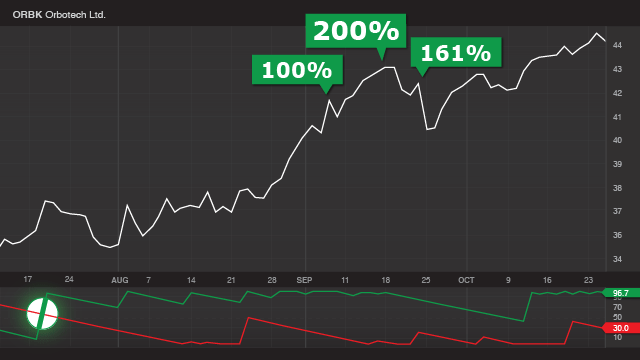 Readers who followed my recommendation had a chance to score gains of 105%… 125%… and 202%. Okay… I’m throwing a lot of numbers at you. And frankly, we haven’t covered even half of them. What’s behind these X Patterns? And why are they such a clear-cut indicator that a stock is going up in price? You immediately realize what a real and permanent force they can be for making money in the market. The simple laws of physics. Think about a golf ball. Sitting on a tee, a golf ball is, well, just that – a simple golf ball. It becomes an object in motion. A force has been applied. That golf ball is now in a state of high velocity. Or it simply succumbs to the immutable laws of gravity and eventually falls to earth on its own. Now, think of that golf ball when you look at this chart. Aspen Technologies is a leading supplier of business software to over 2,100 companies, including heavyweights like Dow Chemical, BP, Exxon Mobile, Shell, Pfizer, GlaxoSmithKline, and others. 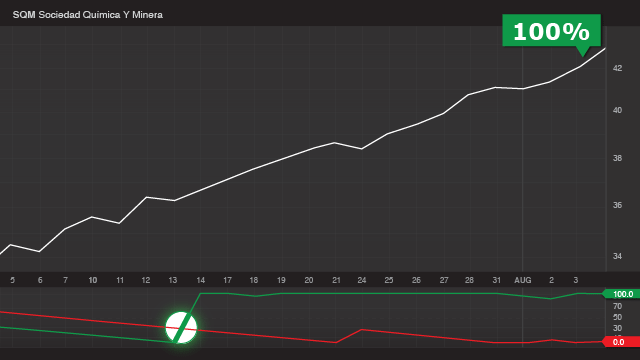 You see how the green line suddenly rocketed straight up over the descending red line. Now think about our professional golfer standing over that golf ball and taking the driver back. The green line crossing up over the red is equivalent to the moment the driver makes flush contact, sending the ball – and the stock – into a state of high velocity. High velocity was achieved when the force of Aspen’s forward momentum – the green line – was stronger than the gravitational forces trying to stop it – the red line. A state of high velocity. It soared from a low of $30 to over $62 a share – a massive move for a $4 billion company in such a short period of time. Now, had you been following Aspen Technology in 2016 – studying their books, listening in on earnings calls, watching for every piece of news, you might have sensed this coming. It was evident Aspen’s business was growing like gangbusters – with net income 209% over and above its fiscal year 2013 numbers. 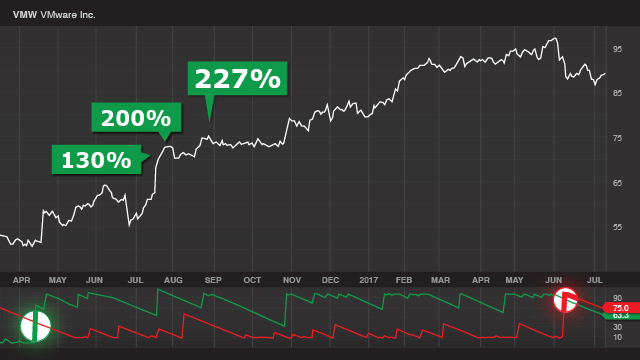 In the same time period, its profit margins nearly doubled from just under 15% to 29.27% – a massive gain for a company its size. Or maybe you came across a Gartner study that reported global IT software spending was expected to jump 7.2% in 2017. All very positive news for a company as dominant in its space as Aspen Technology. And you could have known – at that precise moment – that Aspen’s stock had entered a state of high velocity and it was going up. But this time, look over here to June 13, 2017 – when the opposite happened… and the RED line moved higher over the GREEN line to form a second X. Just as every golf ball in flight loses momentum no matter how hard it’s hit… gravity pushed Aspen’s stock down. Again – it doesn't matter. That red line spiking higher is a sign the stock is losing velocity and is heading down. Not only does this pattern tell you when stocks are going up – it tells you when they’re going down as well. And when it’s the red line is moving higher over the green line… it means the stock is falling. You see, the same idea unfolding with VMware Inc. – ticker VMW. 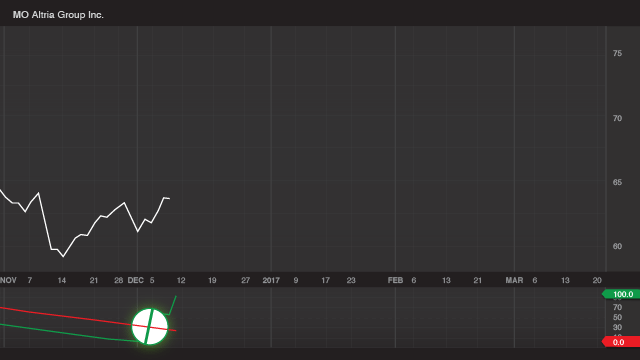 On April 11, the green line shot higher to form an “X” mere days before VMware’s stock rocketed more than 10% in a single day. Until early June of the next year, when the second X was formed… momentum gave way, gravity kicked in, and the stock started to fall. Again, the exact reasons behind VMware’s rise and fall – they don’t matter. And ended when the second X appeared. 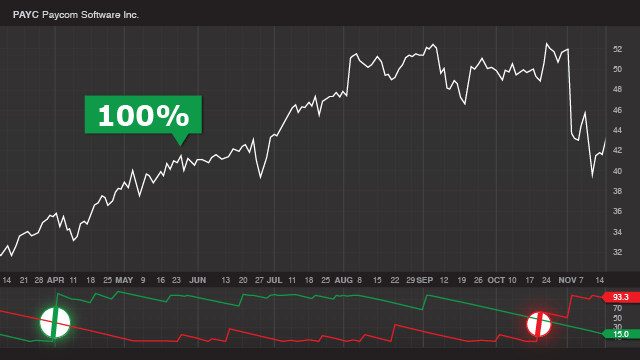 Until October 20, when the red and green lines reverse, gravity takes over, and Paycom’s stock drops. And my readers saw another opportunity to pocket a 100% gain. Now, there’s an added piece to my strategy that makes it even closer to being infallible – which I’ll address in a minute. When you can have “advanced notice” that a stock is going up… it can give you a huge advantage in the market. And nobody knows this better than my readers who follow my recommendations. What do these mysterious green and red lines represent? Why are they such a powerful predictor of stock direction? So powerful, in fact, that I’m willing to wager $9.75 million that they can help you become richer than you ever imagined? Months before most people in the market realize it. You take the number of periods for the stock, subtract the number of periods since that stock hit its highest high – you then divide that by the number of periods again. And finally, you multiply that answer by 100. You end up with a number – ranging between 0 and 100 – that helps you measure a stock’s “momentum” – both in terms of money entering the stock… and money leaving the stock. But let’s say you want to use a 100-day timeframe, for simplicity’s sake. 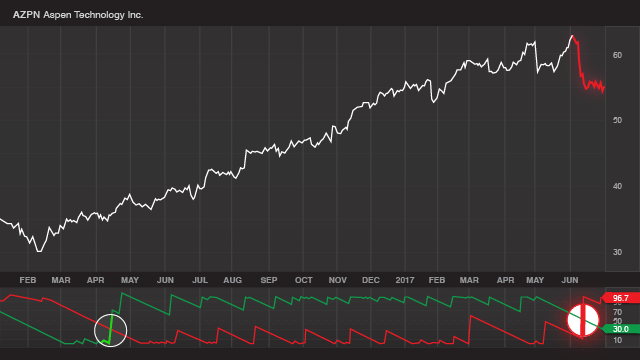 To measure positive momentum, you would look back and count the number of days it’s been since the stock reached its 100-day high. Of course, for that number to have relevance, you also need to measure negative momentum. Instead of using the 100-day “high” as a basis point, you use the 100-day low. So as these numbers are calculated and change day by day – two “trend” lines form. Both forces are exactly equal. But when the green line moves higher, it’s a sign more money is moving into the stock and, therefore, it’s gaining positive momentum. 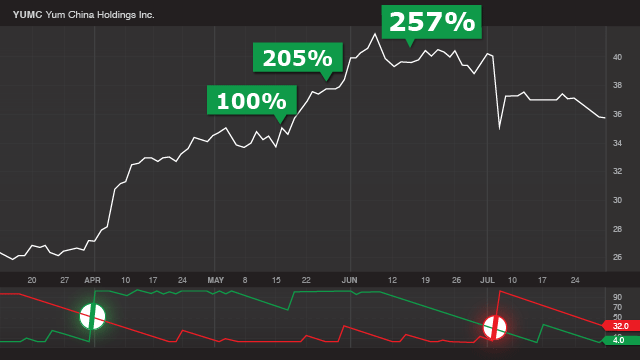 When I saw this “X” form in Raytheon’s chart, I recommended one of my “accelerator” trades –a very simple one-click play designed to help you see big gains on even the smallest move in the stock price. All within a three-month period. Like I said – you’ll never have to perform these calculations to profit. But one thing should be abundantly clear to you by now. When you can know “in real time” when momentum is already changing in a stock – it’s an opportunity for you to make a lot of money… very fast. And there’s no better proof of that than my High Velocity Profits track record. And more than a dozen triple-digit winners have come in 15 days or less. You can just as easily make money when it’s losing velocity. It’s happened 24 times so far for my readers… even in this “up” market. Look at DexCom Inc., a company that develops and sells continuous glucose monitoring systems. You can see the stock gaining… gaining… gaining in June and July of 2015… leveling off in August and September… and then – boom! The red line crosses above the green line September 30 and the stock literally falls over a cliff come November. 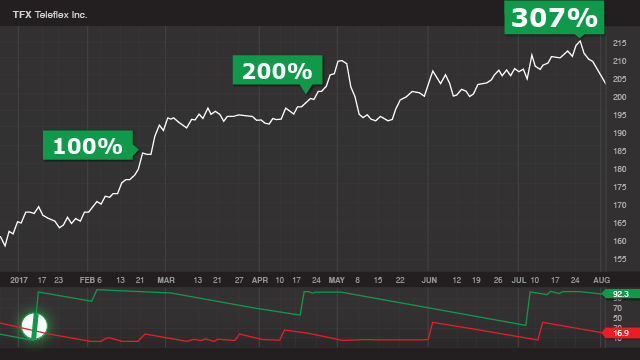 I simply issued one of my accelerator trade recommendations and my readers had a chance to pocket 281% and 381% gains in less than 37 days. Around the same time, a similar “red-over-green” X Pattern formed within Southwestern Energy’s chart. 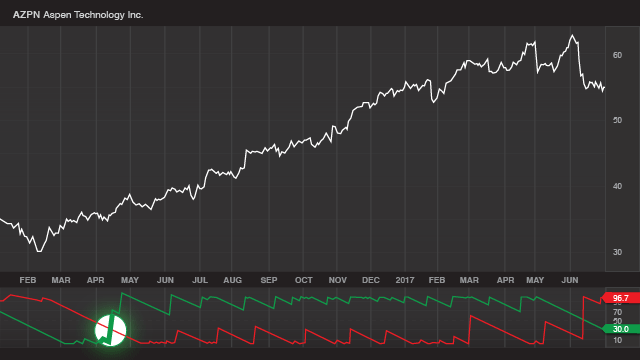 After some choppy trading, the red line shot clear up over the green line in July, suggesting money was leaving the stock like rats off a sinking ship. Sure enough, the stock lost two-thirds of its value as gravity yanked it down. But my readers had a chance to turn this catastrophe into another substantial windfall… with gains of 100% and 264% in just 26 days. 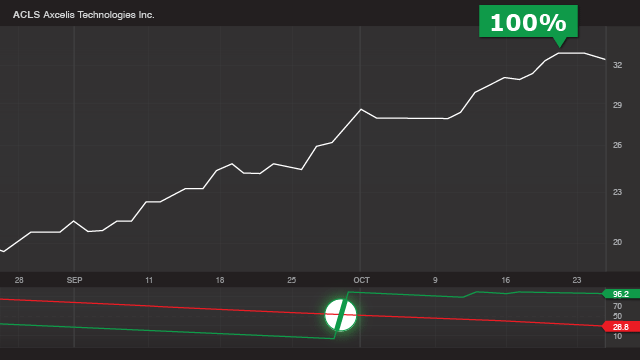 On March 15, a bearish X formed when the red line rocketed over the green line, signaling big trouble ahead as millions of dollars started exiting the stock. The ability to make money whether a stock is going up or down gives you twice the opportunities to profit. And it means you never have to stand on the sidelines if we happen to be in a down market. There’s absolutely NOTHING to stop these gains from continuing – week after week, month after month, year after year. This “X” pattern appears in hundreds of stock charts every year, no matter what the market’s doing. There’s nothing “emotional” about it. 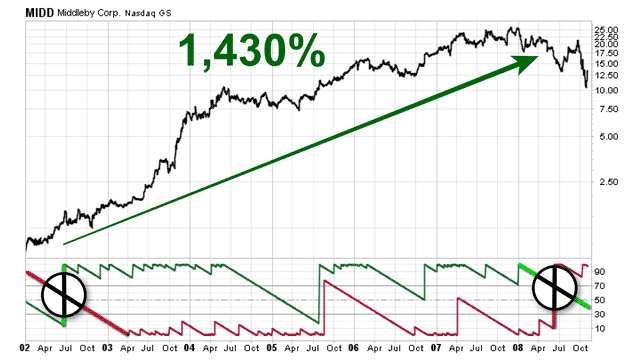 It’s merely a mathematical measure of momentum – money moving in and out of a stock. 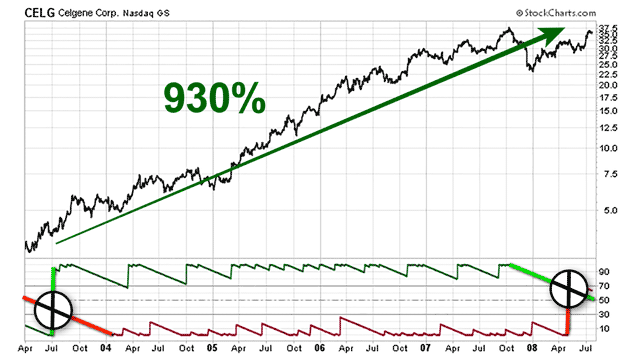 I don’t know of any surer calculation that can tell you when a stock is going up – or down. 81 – more than three quarters of them – triple-digit winners ranging from 100% to 417%. And over $815,000 – each and every year. Which is why I’m so confident I’ll deliver even bigger gains in 2018 that I’m willing to stake over $9.75 million on it! I’ve told you about the simple formula and how it creates those simple green and red lines. Just by acting when those lines form a simple X. So I’m guessing there’s a big question on your mind right now. Why isn't everyone using it? How did something this simple elude the Buffetts, the Templetons, and the Soroses of the world – not to mention every major investment bank and hedge fund? It does not give us the ultimate answer. This pattern in complete isolation does not predict, with 100% certainty, which stocks will enter a state of high velocity. I’ll take you back to the golf analogy one more time. You know that once a club makes contact, it’s sure to move the ball forward. How high that ball goes and how long it stays in a state of high velocity depends a great deal on who’s hitting the ball. If you’re a golfer, you know: Even experienced players will take a big swing now and again only to see the ball dribble a few yards off the tee. There’s a MUCH better chance of the ball reaching high velocity… soaring higher… and staying aloft longer. The same is true of stocks. Big money traders – the people who can make those green and red lines “jump” like they do – they aren’t perfect. Sometimes they move a lot of money into a company that’s fundamentally flawed. In which case it’s not likely to stay in a state of high velocity for very long. So how do you know if a “pro” is driving the ball and not an amateur? That requires another unique discovery that I made. And guess what? It's just as simple as the first. Many legendary investment bankers, traders, and top economists haven't heard of it either. And that's because the F-Score wasn't invented by some hotshot analyst at Goldman Sachs or Merrill Lynch. It was created by a little-known accountant from the University of Chicago and Stanford. His name is Joseph Piotroski. And his F-Score is an incredibly precise metric for uncovering public companies whose share prices are susceptible to enormous profit spikes. In other words… “PGA Professional”-caliber stocks. Again, simplicity is the key here. A rise in net income. A rise in operating cash flow. A rise in return on assets. A rise in working capital. A rise in gross margin. Operating cash flow that is greater than the company's net income. Its ratio of long-term debt to assets has fallen. Its growth rate of sales exceeds that of asset acquisition. The company has not diluted the value of its stock by issuing more new shares to the public than it bought back. Add the nine up and you get a score. 8 or 9 means the fundamentals of the company are excellent. 0 to 2 – not so good. Now, there’s no denying the power of the F-Score. It even beats the returns of funds run by legendary investors like Warren Buffet and John Templeton… and pretty much every hotshot money manager on Wall Street. 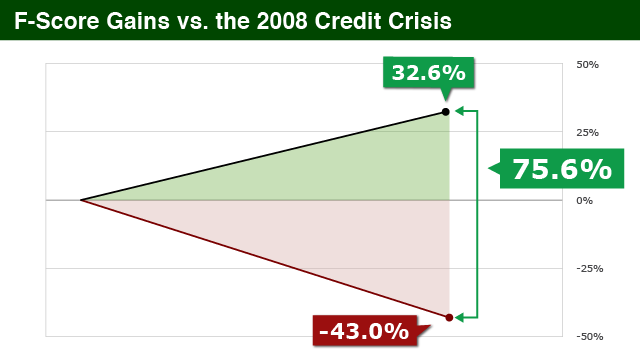 What’s truly amazing about the F-Score is what it could have done for you during the 2008 credit crisis – the year the market dropped a stomach-churning 43%. 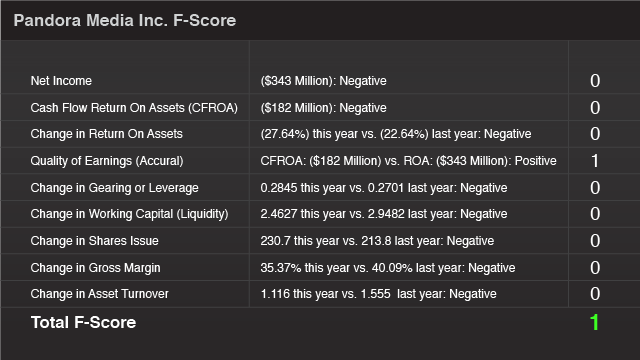 Had you only bought stocks that year based on F-Score metrics alone, you would have gained 32.6% instead. It’s a one-two punch that can lead to unprecedented gains. Of course, the F-Score confirms when stocks are struggling as well. Only instead of an 8 or 9 score – I look for a 2 or less. 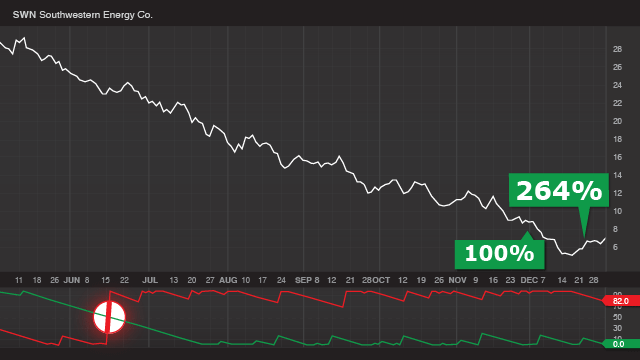 So when a stock has a low F-Score… and the red line moves higher over the green line, you know a stock’s in for a rough ride. 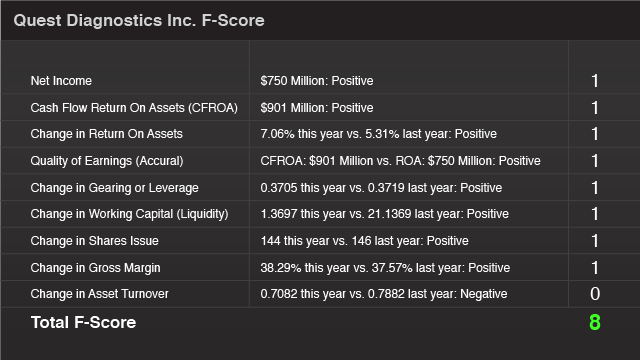 Time after time, this F-Score calculation combined with my “green” and “red” measures of velocity has been the recipe for staggering profits. And big fast profits as they’re going down. Now take a look at Golar LNG. And a green “buy” X forming here. And my readers had their first shot at a 100% gains in just five days. I’m very excited about my High Velocity Profits recommendations. It really is a culmination of my life’s work in the markets. I love it because the numbers never lie. When money pours into a stock and demand soars – it can only go up. When it leaves a stock and demand falls – it goes down. My strategy can tell me when it’s happening in real time. You’ve seen how simple it is. 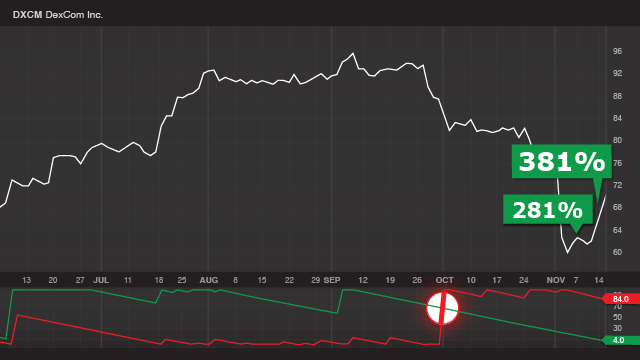 When the green line crosses the red to form an “X” – it means the stock is moving higher. 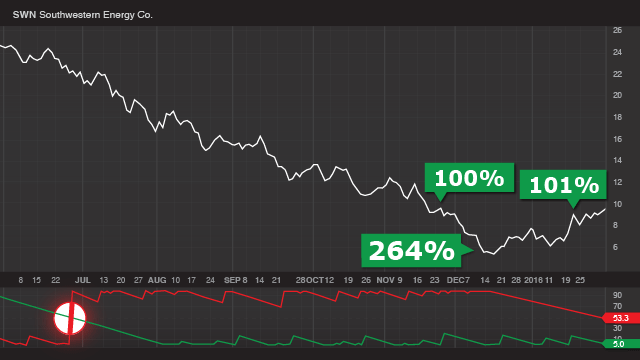 When the red line crosses the green line to form and “X” – it means the stock is going lower. Add the F-Score – and you have about as foolproof of a system for predicting which way a stock is going as the market can ever give you. To 313% over the least 30 days. With a $1,000 initial stake in each play, you could have $163,716 in extra cash. For most people – that’s another income entirely! Raise the stakes slightly and the numbers explode. And if you can see your way to start with $12,000 stake, that could be more than $1.9 million in extra cash coming in! I don’t care how rich you are – that’s a lot of money. Think about the homes you could buy… the places you could see… how much sooner you could retire… the financial legacy you could leave behind. With that kind of money coming in year after year, your life could change forever. Money worries could become a thing of the past. Little luxuries you once thought out of reach can now be yours for the taking. Now, you know as well as I do: There are no “sure things” when it comes to investing. Just because we’re seeing amazing returns right now, it doesn’t mean it’s certain to continue. Which is why I never suggest investing more than you can afford to lose. There’s no shortage of opportunities to make money here. My X Pattern appears in dozens of stocks every month – in any market up, down, or sideways. So there’s nothing to stop these gains… for eternity. 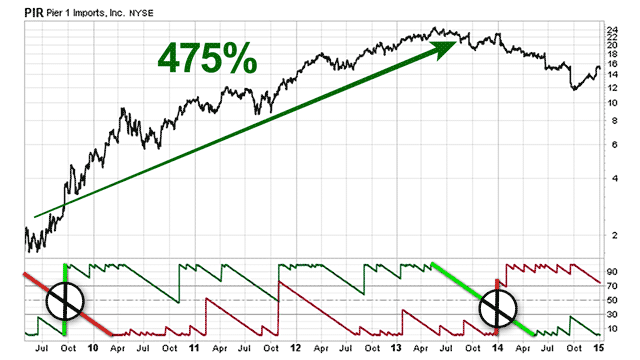 It’s purely a mathematical measure of momentum – money moving in and out of stocks. 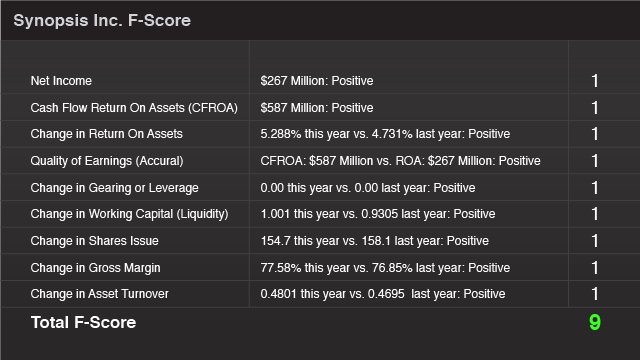 Add in the F-Score and my own analysis, it’s like a “homing device” that takes me directly to stocks that are going up – and helps me find a window where you can profit. And the second “sell” X showed up late January. 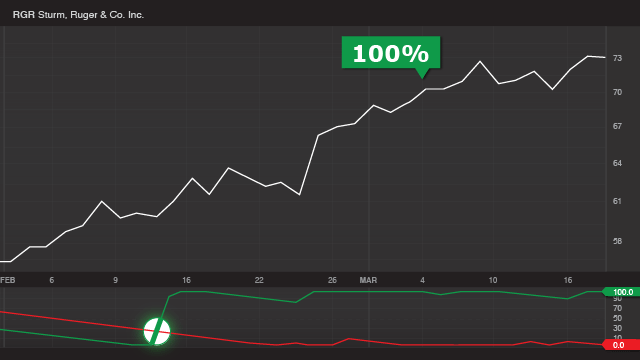 That gave my readers plenty of time to collect impressive, fast gains of 103% and 112%. High Velocity Profits opens the door to opportunities most people might otherwise never see. For instance, when’s the last time Orbotech showed up on your radar screen? The Israeli technology company sure showed up on mine July 18 – when the green line shot up and the X was formed. And we’re still waiting for that second “sell” X to appear! And remember – I’ve only touched on some of the many triple-digit gains I’ve shown my readers with this strategy. 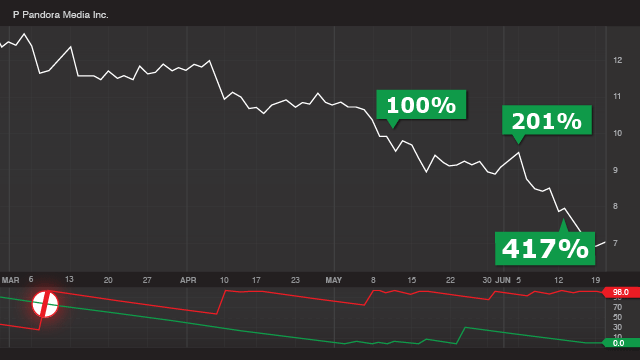 The 100% gain in 14 days with Capital Senior Living. And they continue to come fast and furious. 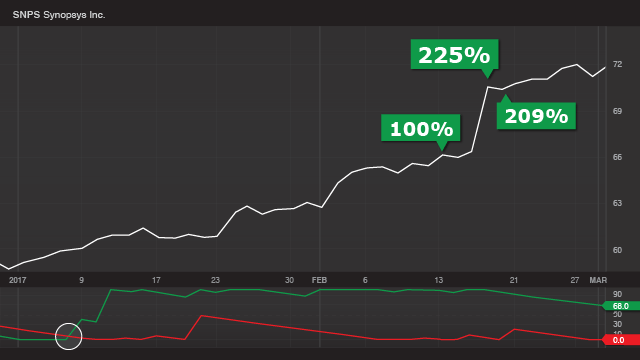 And right now my High Velocity Profits strategy is showing gains in 11 open “accelerator trade” positions – with triples ranging from 112% to 284% in as little as 34 days. I’m now ready to let a handful of new Money Morning readers share in this breakthrough strategy. And you are invited to join. Money Morning has over 2.3 million readers and paid subscribers. What I’m offering to do for you today is unprecedented. Nobody I’m aware of has ever promised to deliver average weekly gains equivalent to 350% for a full year… and back it up with over $9.75 million in assurances like I am doing today. So I’m certain a lot of people will want to take part in this. Of course, not everyone can. Since I launched High Velocity Profits over two years ago and word spread about its success, it’s attracted more than 12,300 paid subscribers. But there’s no possible way I can allow that many people again. Zero to 12,300 is one thing – but 12,300 to 24,600? That’s why I’ll only be accepting 2,500 new members – tops – through this limited invitation. I’ll explain why that’s the case ahead. I’ve laid everything out for you. 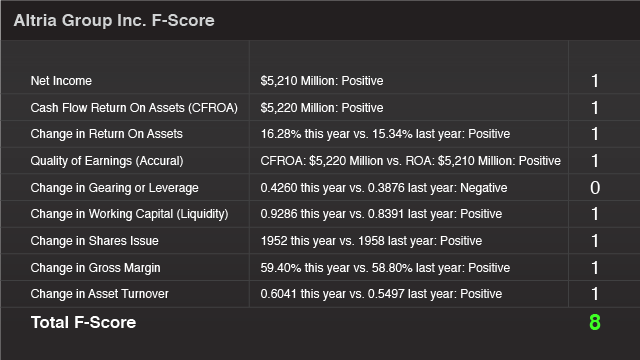 I’ve shown you how the F-Score helps us make certain the big money is “right” – and the stocks they’re targeting are, indeed, built for long-term momentum. The 81 triple-digit winners – 45 of them this year – ranging from 100% to 417% in as little as a single day! And the remarkable 313% average weekly gain over the last 30 days. All that’s left now is for you to take immediate and decisive action. So let me quickly show you how my High Velocity Profits research service works – and how simple it is to follow. The first thing I want to make clear is there’s no “work” on your part. You won't have to know the formulas… track the stocks… calculate F-Scores… none of that. I do all of it for you. As a member of my High Velocity Profits research service, you’ll get EVERYTHING YOU NEED to make the kinds of gains you’ve seen handed to you on a silver platter. It starts with the High Velocity Profits “Alert Recommendations” I’ll send you via email, with “straight-to-the-point” instructions, so you know exactly what to do next. For each trade, I’ll recommend two trading options. Or you can tap into my “accelerator” trade which targets 100% gains or better, quickly, by using simple options to take full advantage of the price momentum the stock is enjoying. Most of the triple-digit gains I’ve shown you today, in fact, are a result of these simple-to-execute trades… including my average weekly gain of 313%. Readers love them because, in addition to the big, fast gains they can produce… you often only have to put up a few hundred dollars to take part in the play. So you can decide how you want to play each recommendation and how much you want to invest. You can buy the stock, trade the option, do both… or simply sit back and watch how things play out. You’ll see a quick “snapshot” of everything you need to take advantage of the opportunity – the name of the stock… its ticker symbol… all the pricing information… along with all the information you’ll need to place the bonus “accelerator” trade for bigger, faster gains. You’ll get a brief overview of the company. Then I’ll explain the F-Score. I even give you the numbers so you can see the comparisons. Next, I’ll show you a “picture” of the play… so you can see what’s happening in terms of the price… the volume and, of course, the velocity. A rising price and a very strong green line crossing above the red showing a classic case of positive velocity. Next I wrap up the play with an “Action to Take” recap… so you know exactly how to execute the trade online or what to tell you broker over the phone. 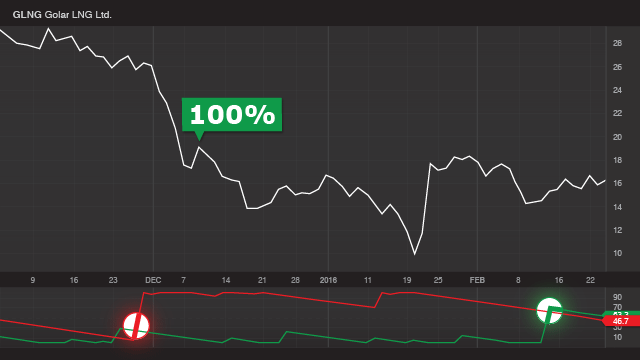 Each High Velocity Profits alert also has a bird’s eye “summary overview” of open plays in our portfolio so you know exactly where we stand all the time. And March 16… when we wrapped up the trade with a 347% gain. So, you see – it couldn't be easier. There’s also a free text alert option where every time a new “buy” or “take profit” alert goes out, a text will be sent to your phone. These text alerts are optional. And you can turn them on or off anytime. But given High Velocity Profits plays can move fast – we’ve had triple-digit winners as quickly as one day remember – this is a great way to make sure you don't miss a recommendation when you’re away from your email. The instant you sign up, you’ll have complete access to my High Velocity Profits Digital Dossier. I’ll also send you two quick-start videos a week during your first month of membership. 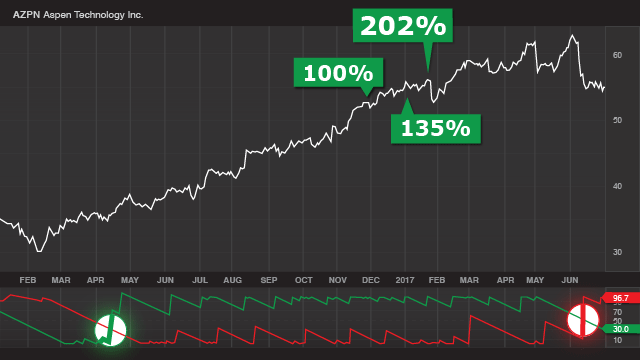 They’re designed to give you a “visual overview” of the service, with more insights into the strategy, tips on portfolio allocation, my methodology for targeting the highest caliber stocks… suggestions for maximizing your gains, and much more. But I’ll stress once more that you DO NOT need to understand the inner workings of this strategy to profit from it. You will not be doing hours upon hours of market research… looking up stocks… or having to work out those “velocity” formulas I told you about earlier. Your job is simply to look for my High Velocity Profits alerts when they arrive – and decide if you want to act on my recommendation. Then another three minutes to close out when I send you a profit alert. So, you see… it’s very simple. And if you do have any questions about the service, my VIP concierge service is ready to help you at a moment’s notice with any issues regarding your membership. This is a team of 35 highly qualified professionals dedicated to my High Velocity Profits service. I have worked with them specifically to help you get the most out of this opportunity. You will be able to call or email them whenever you have questions. Money Morning has over 2.3 million paid members and subscribers. They’re with us because they’re eager to explore new and exciting ways to earn outsized gains in the market. Given the elite nature of a service like High Velocity Profits – I can only accept 2,500 new members into this service – period. That’s about one spot for every 920 people who will see this invitation – so the demand is almost certain to outpace the supply. And because High Velocity Profits has proven to be such a serious moneymaking opportunity – it’s not cheap. I don't have to tell you how wealthy you can become as a result. So if you’re ready to learn how to take complete control of your wealth, High Velocity Profits is for you. Again – it’s not cheap to join. But it won’t cost you $10,000… or even the $5,000 you might expect to pay to join a service of this caliber. That’s because my main objective today is to make sure that almost anyone who is ready to take part… and is ready to take this opportunity seriously… can do so. And you’re among the 2,500 new members I’ll accept into High Velocity Profits through this invitation – the price you’ll pay for a full year’s subscription is just $1,950. I’m also willing to guarantee my results – and your satisfaction. One of the remarkable things about our success with High Velocity Profits is the amazing trajectory our gains have been on. From 59% per week on average when we first started… to 210% over the past quarter… to 313% the past 30 days. It’s a remarkable rate of growth – and that’s no accident. You see, I spent three years researching and backtesting this strategy before I felt comfortable enough to offer it to my initial group of readers. And despite the early success we had, I’ve always known the potential for this strategy was virtually limitless. And you have what amounts to a continuous, virtually never-ending chance at big, fast triple-digit gains. Simply call my team – tell us you’d like a full refund of your High Velocity Profits subscription price – and we’ll issue it on the spot… no questions asked. Even if I’m a single percentage short, and I only average 349% – you’re entitled to a full refund. So that’s a full year of my research – a $1,950 value – yours free if I don't perform. With 2,500 new membership spots we’re opening right now, this guarantee alone has a conservative value of $4.87 million. The amount I told you I’m willing to wager is $9.75 million – not $4.87 million. I’ll give you a second year of my High Velocity Profits – yours for the asking – absolutely free! And that’s $9.75 million in assurances I’m putting up today. Now, on the surface, it’s an enormous financial risk I’m taking on here. But knowing what I know about the unlimited potential for High Velocity Profits to deliver results, I’m confident I’ll be able to “make good” on my bet. If I do, it’ll mean you’re seeing gains that have the potential to make you tens, even hundreds of thousands of dollars richer in 2018 alone. If I miss the mark – or even if I only average 349% per week (because 349% isn’t 350%) – you still have an opportunity to make some great money AND your second year of High Velocity Profits is on me. High Velocity Profits is all about triple-digit gains. That’s what it’s become known for – and that’s what I shoot for with every exciting “accelerator” trade I recommend. Nothing can make your day like logging on to your brokerage account and closing out a trade that just made you 100% gains or better. So here’s what I’d like to do for you today. 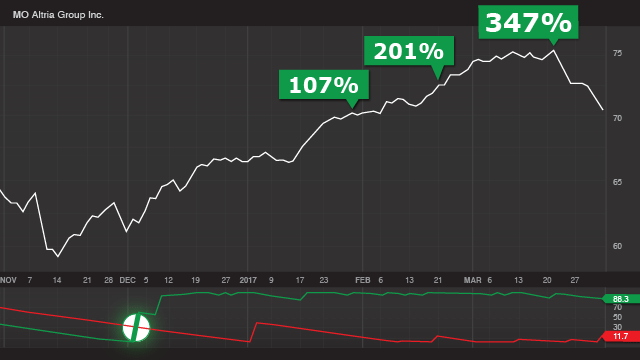 I’d like to DOUBLE UP on my 350% average weekly gain promise and add 50 triple-digit winners to the mix. If in 2018 I don't deliver 350% average weekly gains AND 50 triple-digit winners – you can request a refund AND a second full year of High Velocity Profits is on me. Both these milestones must be met – by me and my team. 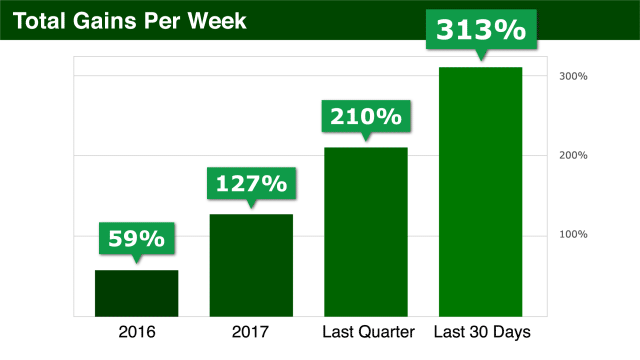 If I deliver 350% average weekly gains… but only 49 triple-digit wins – you can request a refund for this year’s subscription and get a second year of High Velocity Profits on me. 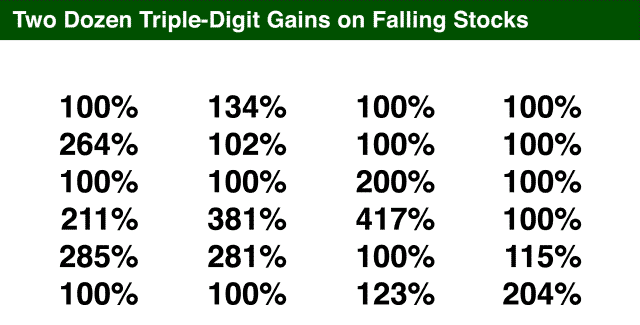 If I deliver 100 triple-digit gains… but we only average 349% weekly gains or less – same thing. So, you see – I’ve made joining High Velocity Profits as easy and risk-free as possible. I’ve made the research fun and easy to follow. I’ve made the subscription very affordable. 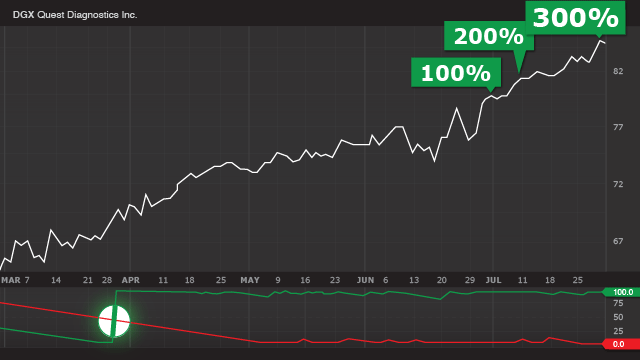 GUARANTEE #2: Your money back AND second year of High Velocity Profits FREE if my track record doesn't average out to the equivalent of 350% weekly gains at the end of 2018. And cashing in on either of these promises is as easy as calling your member concierge and asking for a refund and your free year. I’ve asked my team to make sure that your new High Velocity Profits subscription be extended through December 2018. So, when you sign up today through this invitation, you end up getting an extra month of the service (and a little more) at no additional charge. Now the time for action has come. Below is a button that will take you to the membership form. 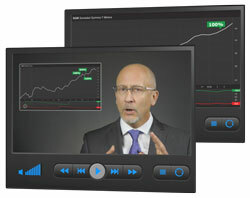 You’ve seen the incredible track record of gains this service has generated in the short time we’ve been “live” with it. I’ve given you the best assurances I can that it will not only continue – but continue to accelerate. 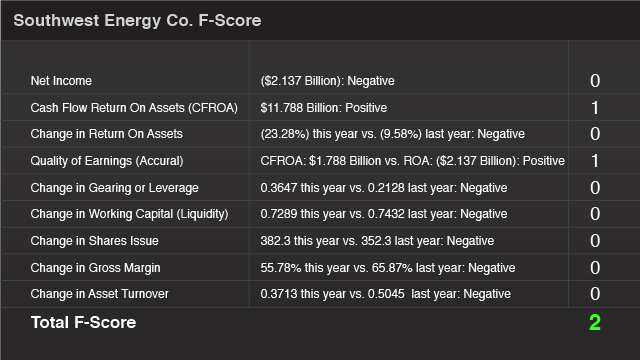 In my 35 years in the markets, I’ve never seen a strategy so potent as when you combine the power of the “X” with the Piotroski F-Score indicator. I’m sorry you’ve missed out on your chance at these windfalls up until now. The good news is you can “right this wrong” starting today. But you do need to act quickly. Remember – only 2,500 new High Velocity Profits members will join through the invitation you’re seeing today. And a fraction of the 12,300 who rushed in through the first invitation. So, if you miss out this time around, there’s no telling how long you’ll have to wait once the spots are gone… or if any will ever open up again. As well as access to the member’s only High Velocity Profits website where you can see active recommendations – and your “Digital Dossier” of material. I promise you, my High Velocity “X” strategy has the potential to change your life forever. You’ve seen the gains and how fast they can come. I can’t wait to welcome you on board! I’m Keith Fitz-Gerald – and I want to thank you for joining me today and taking part in this presentation.